Improper gas cylinder storage can cause serious workplace hazards! Gas users and distributors must be aware of the dangers associated with storing and using compressed gases including the potential for asphyxiation, flammability, toxicity, and high-pressure hazards. Gas leaks due to improper handling, tampering, regulator failure, mechanical stress, and corrosion can occur in industrial and laboratory facilities. Hazardous and corrosive gases such as hydrogen chloride, chlorine or ammonia should be isolated from the workplace to minimize personnel exposure from toxic leaks. Safe cylinder gas storage is also addressed in Federal and Local OSHA, Building and Fire codes. Using the proper storage equipment is a key to minimizing liability associated with these compliance requirements. 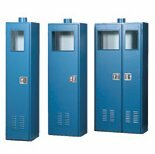 The new GC Series Cylinder Gas Cabinets are designed to provide a safe and cost effective means to isolate hazardous gas cylinders from the surrounding work place. The cabinets, which can safely store 1-4 standard size gas cylinders, are constructed of 11 gauge steel to exceed code requirements. Additional safety features include a large vent exhaust, louvered door panel to provide positive air flow, and an integral sprinkler that is activated in the event of fire. The adjustable cylinder brackets secure a wide range of cylinders, while the removable back panel enables the mounting of gas delivery systems and components. Protect workers and equipment by preventing gas related accidents at the source - by installing cylinder gas storage cabinets.